Standing on the Old Mahabalipuram (Main) Road in Chennai, Lotus Pond from Vijay Shanti Group offers homes at dream prices. A development over 11 acres, the Lotus Pond houses over 1200 apartments over 23 blocks of 8 storey buildings. With 60% of the total land area open to landscaped green spaces it also ensures a pollution free healthy living experience for its select residents. It offers 1, 2 and 3 bedroom apartments spanning from 363 to 1157 sft built to standard specifications. 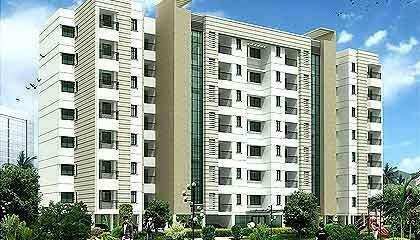 This Chennai property also presents a host of great facilities and lifestyle amenities to its residents. It houses a health club with gym, pool, indoor games, etc. plus library, community hall, elder's park and skating rink. Facilities like departmental store, business centre and browsing centres are also present. Located just 3 km from the Kelambakkam junction, Chennai, Lotus Pond enjoys a great connectivity to major locations of the city being on the OMR. It is close to a number of IT firms like Wipro, Infosys, Satyam, etc. A number of educational institutions like the Fomra College and Hindustan University are in the vicinity. Other landmarks nearby are SSN college, Chettinad Hospital, Lifeline Hospital, Tidal park, Tata office, etc.